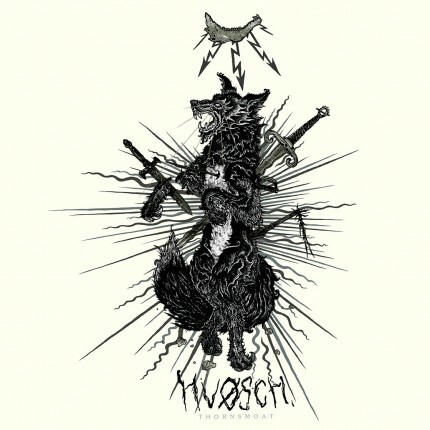 Related links to "Hvøsch - Thornsmoat LP"
thornsmoat. a two-chapter antiutopia about a tough fate of a black fox.a hunter and a couple of dogs are chasing the prey to a certain death. the burrow is clouded with smoke. everyone has burnt alive. he is the last of the free; his death is coming close. the only thing left is to run. towards his fate - or away from it. chewing his paws off trying to escape. stuck in traps for days, animals die slowly and sorely, long before the hunter comes. you need 18 foxes to make a furcoat. the message isn’t straightforward. anti-utopias are always multi-faceted. our work is based on a story about a fox and human cruelty, but if you dig deeper, you’ll uncover hidden parallels about witchhunts; people of faith are always offended by the existence of those who don’t share their ideas of the bible. they build the cult of the righteous; the hierarchy of power leads to punishment of those who oppose the views of the majority. as a rule, people give themselves the right to decide who lives and who doesn’t. the world isn’t just black and white, even separating situations by shade is subjective; it is also true when people judge, harm or kill on the grounds of difference. primarily, the band leans not towards the cult of ideas, but the cult of sense and frugality towards everyone and everything. we don’t appreciate cruelty towards animals and everyone surrounding us. associations and symbols of all that can be found in our lyrics and art.